YOU... you did it !!! Estela Meza was born in Mexico and after living in the United since 1991. She passed her Citizenship exam on February 23 and became a US citizen on a swearing in ceremony on March 19th, 2019. Ms. Meza attended Mr. Proctor’s Citizenship class at Eastside to prepare for the test. She is now taking ESL classes because she wants to complete the program and eventually enroll in a CTE program. She is also looking forward to voting in the next election. Hello. My name is Paulina Garcia and I was a Physical Therapy Aide student at East Los Angeles Skills Center for 6 months. I started this course on August 14, 2018 and completed it on February 1, 2019. I got my Physical Therapy Aide certification. I thank Ms. Cobian, who is one of the most outstanding teachers I've ever had. She guided us and helped us along the way. This course was very engaging and fun to attend. East Los Angeles Skills Center was the place to start my training for a rewarding career! 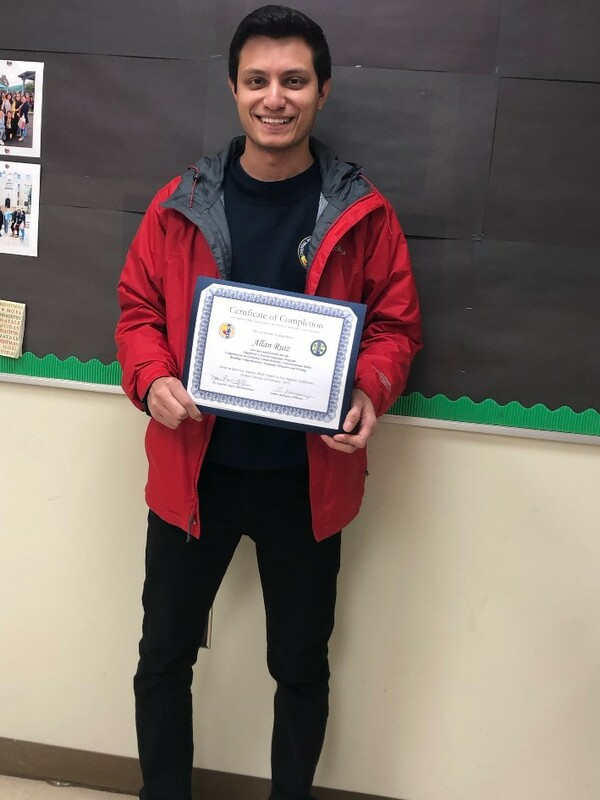 Allan Ruiz completed ESL Advanced Low (Level 6) on Friday, February 15, 2019. Allan was born in Guatemala and moved to Spain as a pre-teen. He attended university in Spain where he studied Law. After graduating and receiving his degree, he practiced Law in his country. In 2018, he came to the United States to be with his then girlfriend. They got married and Allan started school at ELASC in August 2018. Allan completed all four ESL short-term courses we offer to improve his pronunciation and speaking skills, learning a few idioms along the way. Allan has set very specific goals to succeed and improve his speaking, reading, and writing skills. He completed the ESL program on a very high note by scoring 245 on his CASAS test and 12.9 on the TABE test (both highest scores). He prepared his resume and cover letter in class to take with him as he begins his professional life in Virginia. He is leaving our school because he is relocating to Virginia, where he plans to take classes at a college and eventually practice law in the United States. We wish him well and continued success! Grisel Reyes enrolled at Eastside Learning Center in 2016 in our academic program, motivated to complete her goal of gaining new skills and obtaining her high school diploma in 2018. She also worked hard to complete our Medical Assistant program during the spring. She recently obtained her National Health Career Association (NHA) Certificate as a Certified Clinical Medical Assistant. She already has multiple job offers and plans to continue her education. She enrolled in a Phlebotomy program through UCLA extension. Her long-term goal is to be a Registered Nurse. In a visit to her former counselor, Grisel expressed her gratitude to all her instructors: Ms. Alvarado, Mrs. Arrellano, Ms. Aniyam, Mr. Estrada, Mr. Saenz, Ms. Shavers, Mr. Wong, and especially Mrs. Sanchez, for giving her the guidance and support toward obtaining her goals. She also thanked Ms. Costello for her support and all the East Los Angeles Skills Center instructors as well. Grisel is an exemplary student who distinguished herself through her motivation, enthusiasm and positive rapport with staff and other students. Grisel came to the United States from Mexico as a young woman to get a better life and better opportunities. She is a single parent with two children, and has had to overcome many obstacles and hardships to keep herself and children secure and motivated. She is a great example for them and for other students. Way to go Grisel! Miriam Aguilar, an employee at ALTA MED, and former student at the Skills Center, where she graduated from the Medical Assistant Program in 2017 and the CNA Program in 2018, came to visit the center to share her success story. She thanked her former teachers: Ms. Quintanar and Mr. Gonzalez, who supported her along the way and helped her succeed in the programs. She has plans to continue her training in the medical field. Her next goal is to go into a License Vocational Nurse Program and climb the next step in her educational pathway. Eventually, she would like to enroll in a nursing program in college; but as she put it: “I’m taking it one step at a time.” We are very proud of Ms. Aguilar’s success and wish her many more. ELASC graduate Aurora Garcia from Victor Estrada’s individualized instruction lab receive certificates and gift cards for first and second place finishes in the LAUSD District-Wide contest. Aurora is a class of 2015 graduate working to save for college entrance in the near future. CONGRATULATIONS! Former CNA student Christina Reid from Ms. Quintanar”s class is working at Huntington Hospital in Pasadena as a Nurse Assistant in the Surgical Unit while studying to complete her Registered Nurse Degree at Mt San Antonio College. ELASC Cosmetology graduate Karla Martinez (left), from Ms. Diana Mercado's Cosmetology Program (right), visited ELASC last week to show off her newly acquired Cosmetology License. 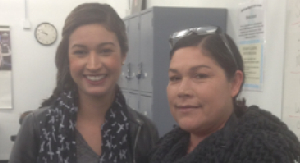 Karla passed her California State Board examinations and is now licensed to work in California as a Cosmetologist. Ms. Martinez attributed her success to the preparation and instruction she received from Ms. Mercado’s classes. She is now working in a salon! Congratulations! ELASC student proves that following a full course of study pays with a job! Ms. Giglio’s student Herenia Avelar enrolled in the Intermediate-Low ESL and VESL Health Career Classes in March 2015. As a result of her hard work and dedication she increased her English comprehension skills by three grade levels to become eligible for the CNA program. 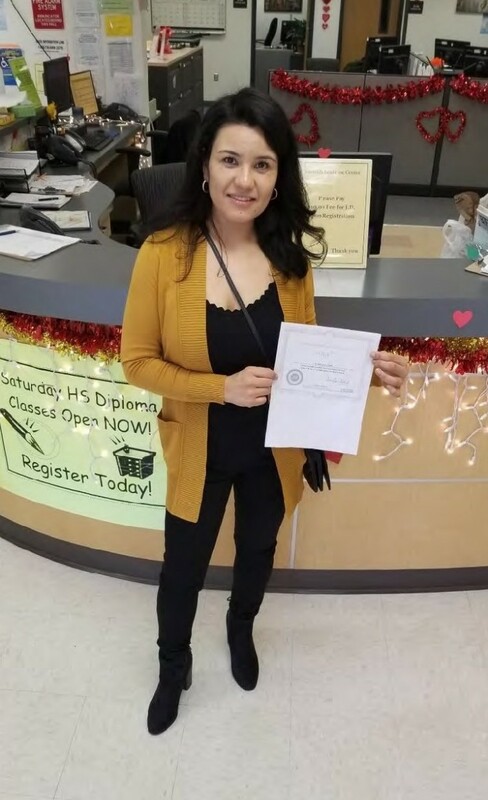 Ms. Avelar obtained her CNA/HHA certification and passed the State Board Licensing exam in October 2015 and is now working as a licensed CNA at a private residence in Pasadena!